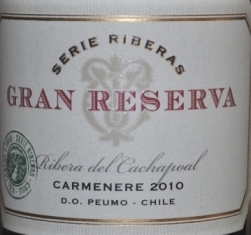 Really enjoyed this one and a beautiful execution of Carmenere at a Costco price of only $13.99. Fresh and vibrant nose, then blueberry and dark fruit combine with chocolate flavors on the palate. Finish retains that fresh fruit, dry, chalky and lasting. Getting a little stone/slate on the finish too as a little time passes. A fun one for a change from the usual varietals. Give it a shot with some hamburgers off the grill this summer.